Starting today you can head out to a theater to see The One I Love (review here), director Charlie McDowell’s feature film about… well, I can’t say. Let’s just keep it thematic and go with “personal connections.” It’s a film that gives you a lot to talk about, and luckily I had the chance to do just that with McDowell. Don’t worry, no spoilers! Rebecca Pahle (TMS): The One I Love is an unusual film that doesn’t really fit into a genre box. It’s tough to describe. Did you have any doubts when you were making it, like “Oh, people aren’t going to respond to this. People aren’t going to like it”? Charlie McDowell (CM): I did have doubts, but for me, I didn’t know if I could verbalize it very well, but I knew the movie I wanted to make. And ultimately I felt like it was a movie that I would want to see. And that was the movie I wanted to make. I didn’t think too much about, “What audience would this connect to?” or, “There are these sort of sci-fi elements to it, is that gonna totally cut people off from wanting to see it?” I didn’t think like that. For me it was, “How do I tell a sort of universal-themed story and have characters that you can relate and connect to?” And then I want to take you in a different way, in a way we don’t see all the time. And for me, hopefully you would connect to that movie moreso than a movie that had a sort of traditional narrative. I looked at films like Eternal Sunshine [of the Spotless Mind], Spike Jonze movies, Charlie Kaufman—those were definitely influences. Eternal Sunshine is essentially a guy trying to get over a girl. That’s the plot of the movie. And they take you on this wild ride. And because of that I really connect to that movie, and I wanted to do something similar. TMS: I love those sorts of “stealth sci-fi” movies. Speaking as a sci-fi fan, I think the genre needs more of that original storytelling. CM: Yeah, I think people are really scared of touching it. It’s one of these genres that feels like it should be left alone in its own world, you know? And for me it was exciting to be like, “comedy and sci-fi and drama can all exist together.” You don’t typically see that, but I think it can, especially if you’re just playing with certain aspects and themes of the genre and not going super-traditional, like “We’re on a space ship!” That was definitely a conscious decision, and ultimately I was happy with the fact that I got to make the movie that I wanted to make. TMS: Something else I like was the lack of exposition dumps — you never find out things like [REDACTED FOR SPOILERS, BUT IF YOU’VE SEEN THE MOVIE YOU KNOW]. Did you put thought into that? Do you know the answers to all those unanswered questions? CM: Yeah. Any question that you probably have, we have had a long conversation with an answer to that question. That was mostly because we never wanted to break logic or the rules of what the game is. So as long as we have answers and we stayed to those different rules, then it was OK to take you places that felt surreal. It’s interesting, because we started to test the movie a little bit for family and friends, and people started to say, “I want to know more about this.” So we had a lot of footage where we edited in, “OK, here’s the version with all of this.” And they’d be like, “Oh no, I don’t want to know all this! Pull it back!” So we’d pull back even more, and they’d say “No, I want a little bit more!” It was a lot of that, a lot of back and forth. And ultimately, for me, the movie is as much in the middle as possible. We’re going to give you some information so that you’re not totally annoyed and you don’t check out of the movie, but were not going to go into things that are ultimately irrelevant to this character’s journey, and emotionally who these characters are and where they’ve gone, because that’s what people should be focusing on, and not the wormhole logic ideas. It’s irrelevant, and it’s not what it’s about. If we had to really go into that then we felt like we didn’t do our job right, ’cause that’s not what the movie is focused on ultimately. TMS: I saw in another interview that you had heavy collaborative atmosphere on-set, and that you encouraged Elizabeth Moss to bring a kind of female perspective. Can you elaborate on that a bit? Because she was the only woman in the film, obviously. 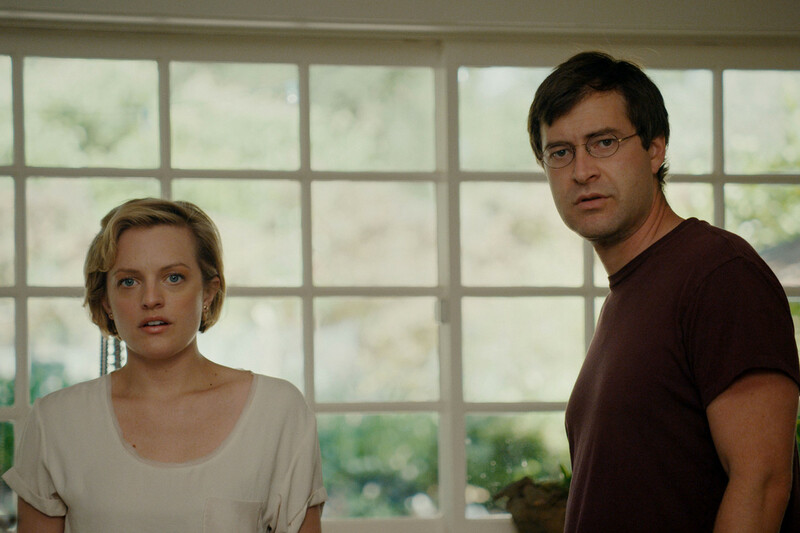 CM: Luckily, all the men in the film come from families—I have three sisters, was raised pretty much by all women, [co-star, co-executive producer] Mark [Duplass] is married and has two daughters and has a very strong wife, so none of us came into it feeling like, “We’re men and we know what’s best!” We were totally understanding and respectful of the female voice and really encouraged and wanted it. With Lizzie, she was so used to the sort of Mad Men schedule of, “Here are your lines. Here’s what you say. Here’s how you say it.” And this was, “What’s your past, how do you think, how do you view relationships, what would you do in this situation?” And then her, along with our producer Mel Eslyn, who’s also a female, they were the female voices. And we would have these discussions of , “OK, well this is what I’d do in this situation—what would you do?” We really felt like we found a nice balance of it. And then I also met with an editor, Jennifer Lilly. And for some weird reason—I didn’t really know why, but I really wanted a female to edit the film. And I think ultimately it was just that you find so much of this movie in the editing room, especially with all the improv, and I really wanted to have that collaborator be a woman and kind of continue that process that we had on the set, which is, “OK, well I don’t think this best represents this character. Here’s why.” And I might not think of that. It felt like it was a really nice balance where we gave weight to both male and female, and it wasn’t just, “Here are some guys making a movie, and we can only focus on what the male character is doing and thinking.” It was important to us to play with both. TMS: Given the secrecy around the twist, this has to be a tough film to market—there’s so little you can say about what it actually is. CM: We’ve really found a way to discuss it and talk about the themes of the movie and the story we were trying to tell with these characters. And obviously people know that there is some aspect to it that’s a twist or a reveal or something different. But ultimately if we can express the tone of it, then hopefully people will be interested in seeing it. Once we premiered at Sundance we thought, “The cat’s out of the bag. People are going to know and talk about it.” When we realized that no one really did. The reviews all kept it close. They were like, “We’re not going to tell you what this is. You should just go see it without knowing anything.” When Radius acquired the film, we said “We really like this—using this model as the marketing.” And they were like yeah, let’s do it. Which was so cool, ’cause you don’t think a distributor would do that. You’d think that would be just about “How do we get the most amount of people to see it?” With the poster and now the trailer, we’ve really continued this idea of “We’ll give you a little bit of the world. Here are the characters. But we’re not going to tell you really what the movie’s about. You just have to go see it.” And hopefully that works. But we’ll see! The One I Love is out in theaters starting today in limited release from RADiUS-TWC and is also available for download via iTunes.